Remember this past NFL offseason, when all anyone could talk about was whether or not the New England Patriots used under-inflated footballs in a 45-7 victory over the Indianapolis Colts en route to their fourth Super Bowl of the Bill Belichick/Tom Brady era? Because I sure do. And it was horrible. Enter Ben Goodell, a seventh grader who already seems more in tuned with reality than the commissioner who he shares a last name with, who wants to put an end to "Deflategate" once and for all. And boy, do I hope this actually works. 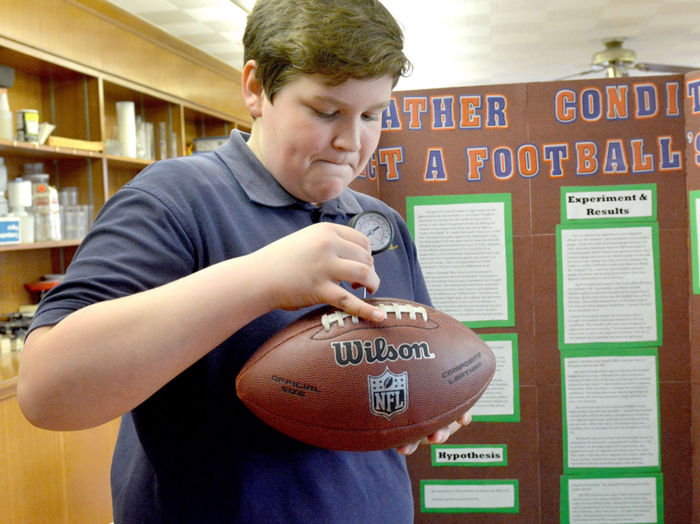 "I wanted to prove that Tom Brady is innocent," the 12-year-old St. Pius V Elementary School student said. He and about 120 other students participated in the school's annual science fair, and he won the Outstanding Project Award, which is awarded to only eight students. Goodell's project took a standard inflated NFL football and exposed it to different elements, including humidity, snow and ice. The ball deflated two PSI (pounds per square inch) every time, which is the lowest recorded PSI from Deflategate. And hey, if this means we never have to talk about Deflategate again, it's a victory for all of us.